Let’s setup a VPS or Dedicated machine which is running on Ubuntu 16.04 LTS, I will suggest LTS only because they have a long term support and stable enough to secure your machine. I personally like DigitalOcean as it is best and leading cloud hosting company based on Fast SSD hard drive which makes things get processed super fast. Now here we need to secure the PHP7.0 since it has a small loop for hackers (don’t be panic) by default for which we need to edit PHP.ini file. We can use any of text editor like nano or vim. In our case we are using my favorite editor nano. Now find “cgi.fix_pathinfo” without quotation mark. Use Ctrl+W to activate search function in nano editor. Now you will see that its value is set to 1 by default like this cgi.fix_pathinfo=1, so change its value to 0 like this: cgi.fix_pathinfo=0 and save it via Ctrl+O. Now here we have successfully installed MariaDB. Since managing database from command line interface is time consuming we are going to install PHPMyAdmin here which will let you manage database from a Graphical User Interface. While setup you will be asked to choose web server (Apache or Lighttpd) where we will choose none (use tab to navigate) and and select Okay. Then we will be asked for configuring database we will chose Yes there and then we will be asked for password for accessing PHPMyAdmin. Since root user is disabled in this setup we need to create another root user which we can use to login in PHPMyAdmin, here is how to setup a new root user. Here user can be any user you want to choose and use a strong password for that user. PHPMyAdmin will be accessible from http://IP_or_DomainName/phpmyadmin just make sure that you have pointed your domain name in advance while accessing PHPMyAdmin by domain name. Without Postfix we won’t be able to interact with email functions like forget password email and contact us forms so we need to install one client software and postfix is one which we used here and while setup we do not have to configure anything here just hit okay and let all the value set to default. Now delete everything using control+k and paste the following configuration which I have made easy to use. Do not forget to change the domain name from above configurations. I have used non-www as well as www version of domain name because we can set anyone default in WordPress itself in Settings » General under WordPress Address (URL) and Site Address (URL) sections. At the end restart all the services once. Now the WordPress Download… and further configs. Now we have WordPress files ready and now need to connect it with a Database. Open PHPMyAdmin in a browser and create a database over there. Enter into that database and move to Privileges Tab and click on Add User. Under Database for user section Check/Tick on Grant all privileges on database “DATABASE_NAME”. Now we have database ready. Let’s connect WordPress to Database. Edit database name, username and password; once done save the file. Now go ahead in run WordPress setup from browser via IP or Domain Name if you have pointed that in advanced. 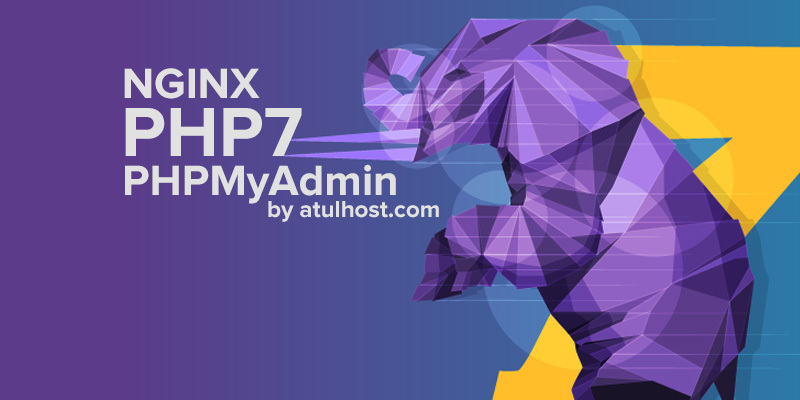 Finally we have installed WordPress on NGINX PHP7 with PHPMyAdmin on latest Ubuntu 16.04.